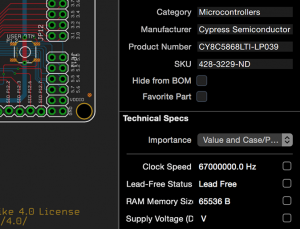 Open EAGLE files and use Copper as a reference while soldering your PCBs. Create gorgeous 3D renderings for your webpage and social media. 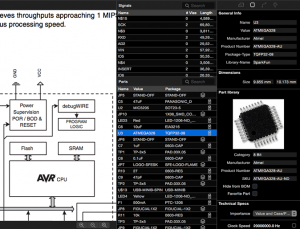 Find errors analyze your designs quicker and faster than with EAGLE. 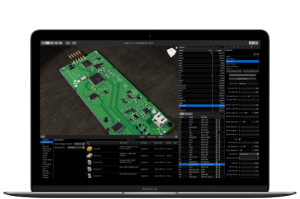 Copper automatically creates awesome 3D models of your board and is able to render them to photorealistic images in real time. Ultra precise, and again with style and ease. Copper is able to dynamically create most often used parts like QFPs, QFNs, SOICs, SOTs, axial and radial Through Hole Parts like resistors, capacitors and diodes based on the 2D footprint. All you have to do: nothing but activate the 3D view. 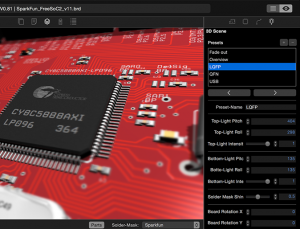 Copper has an extensive 3D part library directly built into it, too. Hundreds of parts are available today, and more are added constantly by us and the community. 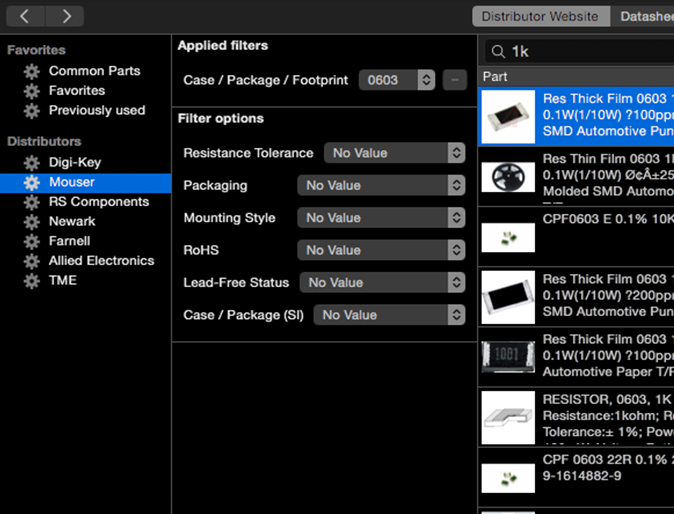 Select a part in the list and Copper automatically searches our 3D part database for matching parts. Double click it, and fit the 3D representation to your 2D footprint in seconds. If you can’t find a part you can create your own by uploading a STEP CAD model to the global Copper library and share with others or keep it private. It’s very hard to get good photos from a PCB as there are so many reflecting parts on it and everything is so tiny. Why the effort? 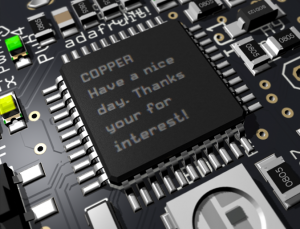 Copper will produce wonderful 3D renderings of your PCB. And did we mention your Mac will render it in real time! As there are no standard footprint packages in EAGLE everyone uses slightly different footprints that they either download somewhere or build themselves. To match 3D parts to these footprints Copper offers precise and fast control to modify position, scale and rotation of the 3D part. 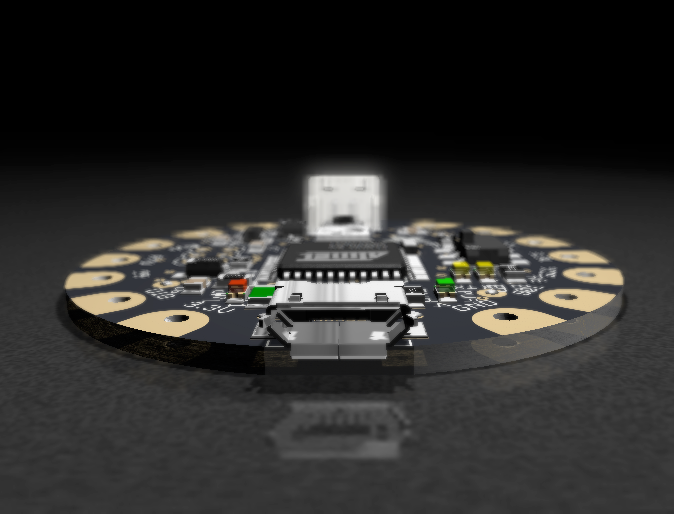 Copper offers gorgeous 3D rendering of your PCB including parts. By using Coppers 3D scene setup you can modify lights, floor materials, camera position, aperture, depth blur and various other settings. It’s also possible to save various settings as presets. And you can produce great images without being a 3D artist or photographer. Copper offers hundreds of 3D parts like pin headers, capacitors, various diode and IC packages, LEDs and many more. Parts are added each day by the community creating and sharing new parts by uploading STEP models. A lot of parts are procedurally generated and thus fully customizable. ICs like QFN, QFP or SOICs can be customized in every aspect like pitch, pin length, pin height, body chamfer and many more. You are in charge. Present your PCB in dramatic lights and in awesome camera perspectives. Creating these pictures using photography is very hard and expensive, using your modern 3D graphics card built in your Mac and Copper it’s a matter of seconds. Using Coppers procedural Part Generators you can build your own IC parts like SOICs, QFNs and QFPs. And you can even customize it’s marking and branding. 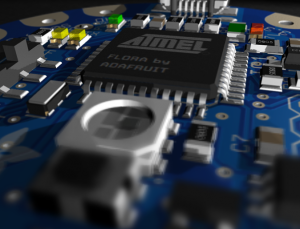 Choose typical IC brands like Atmel, Freescale and Cypress and enter additional text. All beautifully rendered in Copper. 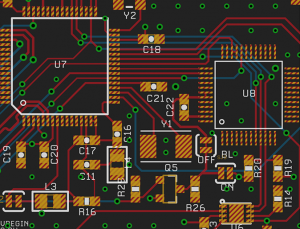 Copper renders your PCB layouts exactly as EAGLE does, but faster and with style. When you hover your mouse over a trace or part, Copper immediately highlights the whole signal or part and displays further information in a small tooltip. Click and the signal or part is selected providing even further information about it. This allows for ultra fast board analysis and is a lot of fun, too! Copper lets you turn the whole board on the bottom side. Gone are the days where you had to wrap your head around that mirroring stuff. Just watch the board exactly as it would if it would be lying in front of you. Copper uses an advanced, retina ready rendering engine with nice, balanced color themes and awesome text rendering. Copper tries to mimic EAGLEs rendering while optimizing it wherever it’s reasonable. 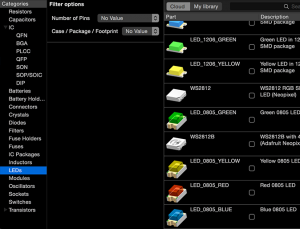 Select multiple parts by just selecting them in the parts list. Selected parts are immediately highlighted in 2D view. This way you can easily locate parts on your board for soldering assistance or when analyzing your board after soldering. 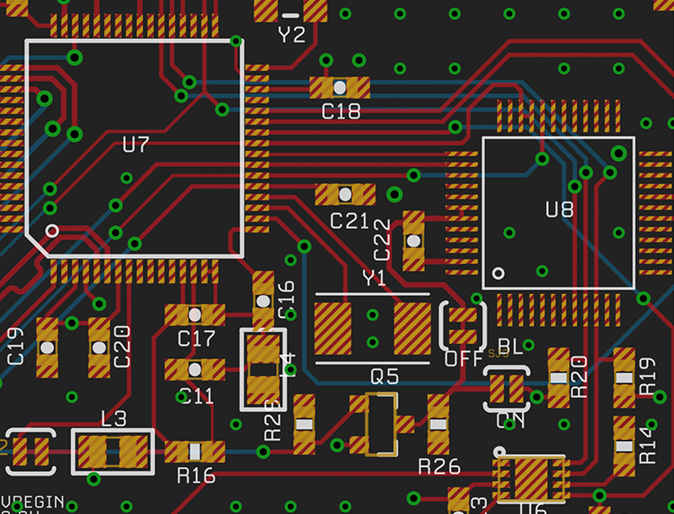 Watch your PCB from top or bottom with a single mouse click. Copper will reorient all layers to optimize rendering of your PCB. You never again will have to think about how to orient parts when soldering your board. X-Ray is a great feature as it’s a real time and click saver. In EAGLE you have to switch off every single layer to get rid of the bottom layer (i.e. Bottom, bPlace, bNames, bValues, …). In Copper you display or hide the opposite layer with X-Ray. The individual layer visibilities stay intact. Copper is the ultimate assembly tool. Just select i.e. all 0.1 uF Capacitors and place them on your board using the reference on your screen. 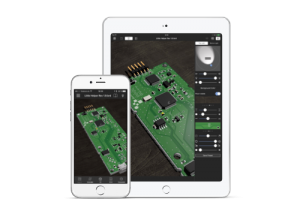 It’s never been simpler and faster to solder your prototype boards at home. 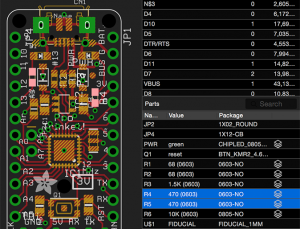 Image shows Adafruit FLORA PCB Layout. 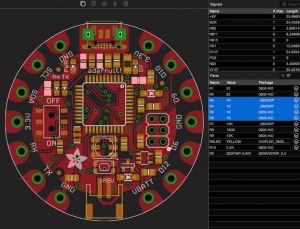 Polygons are a very important part of a PCB, especially for Top and Bottom GND planes. We did invest a tremendous amount of time to get polygon rendering right. Copper supports Polygons with and without Orphans and produces the same copper layers as EAGLE does. BOM Management, i.e. part sourcing is a pain. Copper is here to help. 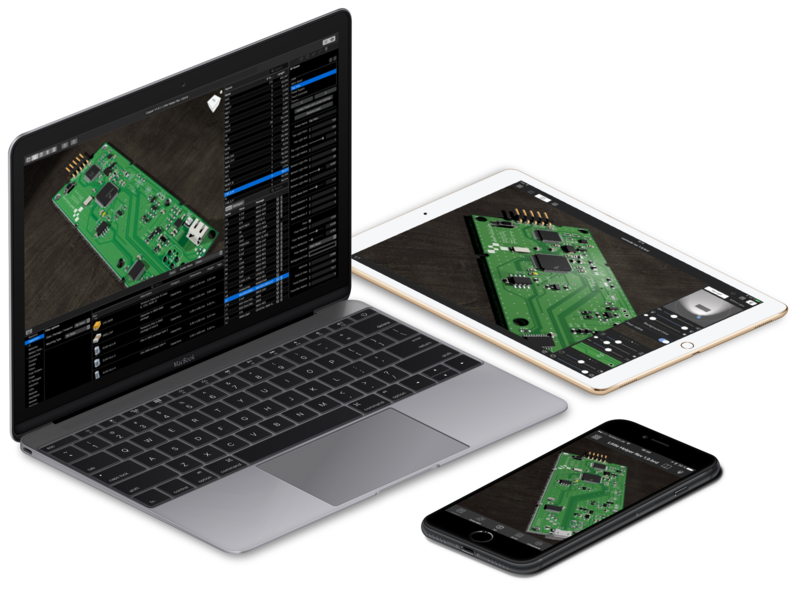 We have partnered with Octopart to streamline the workflow from a PCB layout in EAGLE to a ready to order layout and BOM. Select a part and in BOM management mode Copper automatically fires Octopart with the keywords Copper extracted from your board (i.e. the value, package size, etc). You can fine tune your search using keywords or by setting intelligent filters that are matched i.e. to part category and various other things. By filtering for distributors you are able to keep the number of distributors small in order to minimize overhead and additional shipping costs. 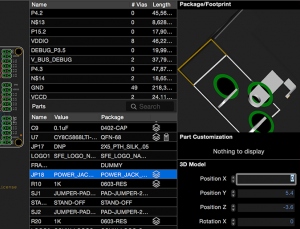 Part specs, part number and various other settings are now connected to your layout and the specific part. By clicking a few boxes you can set tick part specs that are very important for your designs. This info is extracted with the BOM so your manufacturing partner is able to source other parts without compromising your design, if those you selected are not available or too expensive. Part sourcing is a snap using Copper as we have implemented the best part sourcing tool in the world: Octopart.com. Octopart features awesome search and filter capabilities and they are all built right into Copper. If you like a part, you will most likely stick with it, or you will want to test drive it in your next design. Mark parts you search and find as favorite. A special smart search group will show you all your favorite parts and even shows the parts you recently attached. This way you will never search again your 0.1uF capacitor for your next prototype. In Part Browser Copper shows small icons for every part. That way you can see the state of your part sourcing efforts immediately. 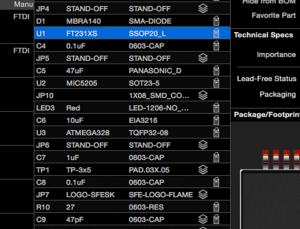 The icons show if a 3D part and a real part (part number) is attached to the part. And remember: This is all done in a non destructive way. All the info Copper attaches to “EAGLE”-parts are stored in a separate file. If you have attached part numbers directely in EAGLE or by using Coppers extensive part sourcing technology based on Octopart you have done the hard work. Finding the best combination of distributors now is nothing more than a few clicks away. Copper uses part numbers to query Octopart using a selection of distributors you select and will display the result in a nice table showing which distributor has parts available and at what price. By utilizing Octoparts BOM tool Copper is able to display current pricing and availability for each part in your BOM with one simple query. Within a second you will see which distributor has most or better all your parts. If only a few parts are missing you can select a part and try to find a comparable part at this distributor to keep the count of distributors as small as possible. 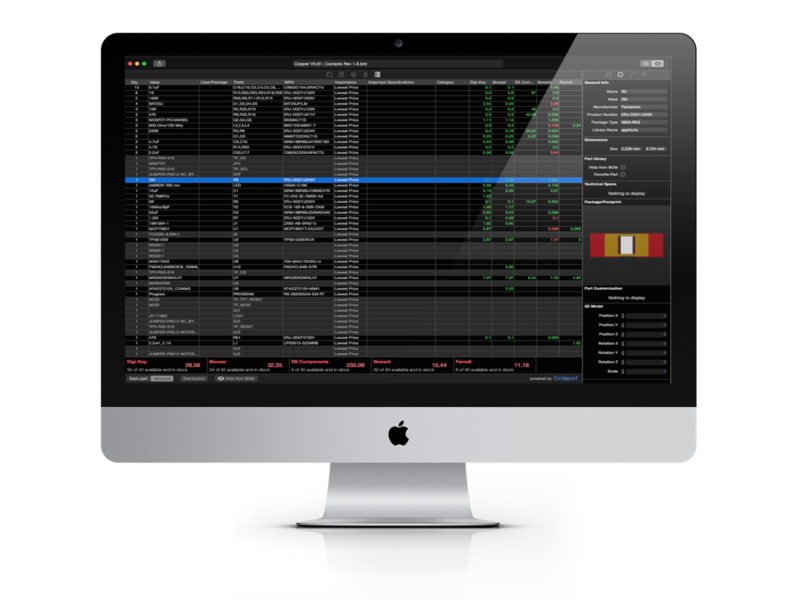 Customize your BOM display and management using a few easy to use tools. Select your favorite distributors from a list, decide if you want Copper to group parts with the same part number and it’s also possible to hide specific items from the list (like test points, pin headers that should not be assembled). 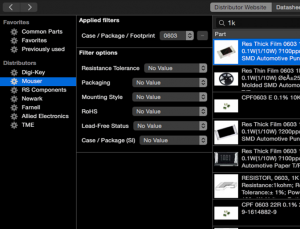 By using Coppers part sourcing technology based on Octopart every part you attach to a real part number will show detailed specs in the Inspector. 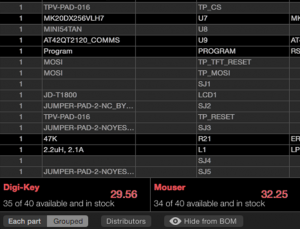 You can even mark specific specs as important and that’s even exported with the BOM file. This way you and your manufacturing partner don’t make any mistakes later on when producing your board. 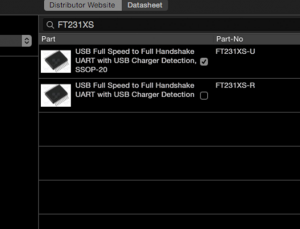 How often did you search for the same datasheet over and over again? We did a lot. How often did you search for this specific diagram in the 1.000 pages datasheet PDF of your favorite ARM MCU? We did a lot! And we solved it. Whenever you have connected a “real” part to your EAGLE footprint using Coppers BOM Management system the datasheets will be stored in an internal database. Whenever you click this part in Copper, the datasheet is just a click away and will be directely shown in Coppers Datasheet viewer. But wait, there is more. Add bookmarks and name them. This way you will never have to search the same PDF over and over again. 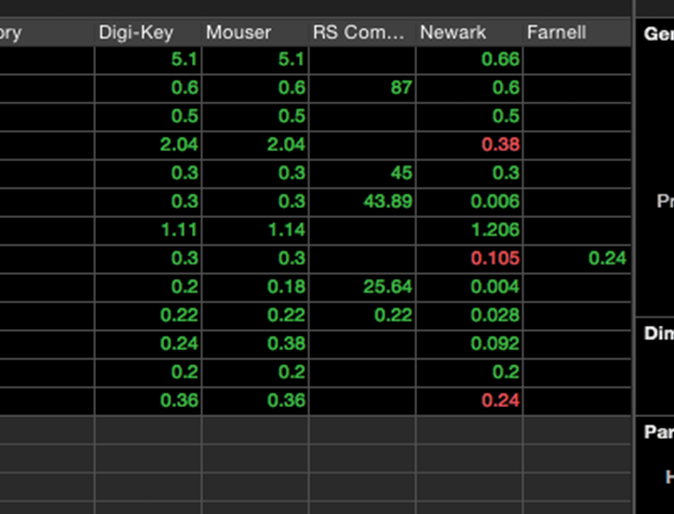 And of course all of this data is stored in the companion .cop file. 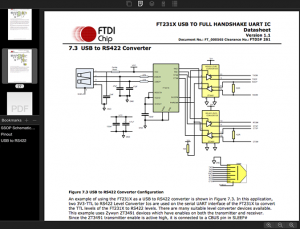 If you share your settings, bookmarks of datasheets will be shared, too! 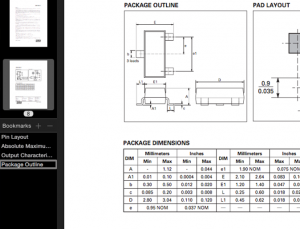 Coppers Datasheet Viewer is an ultrafast PDF viewer that is directly built in. Continuous Scrolling lets you scroll through even long PDFs in no time. Thumbnails on the left side allow for faster navigation. You can even Zoom In and Out. Datasheets are stored on your hard disc and managed by Copper. Data sheets are incredible useful, but they also contain tons of information. 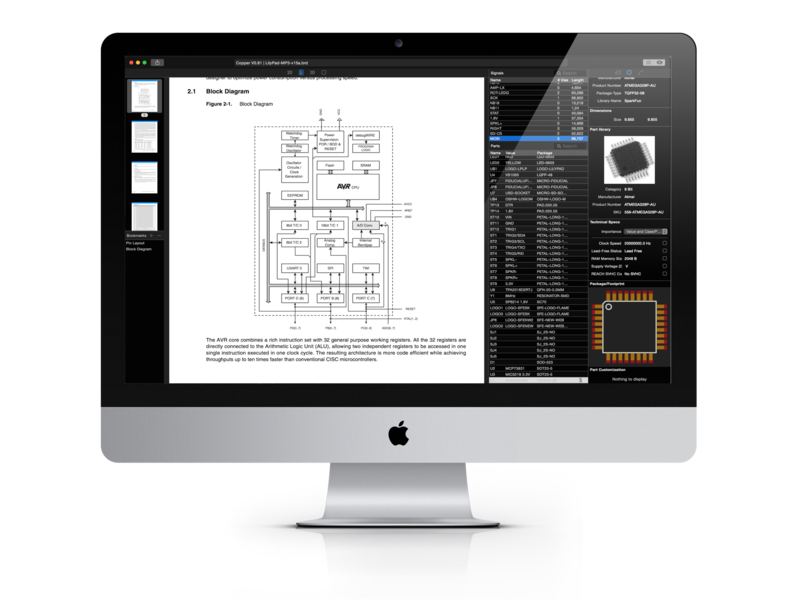 It’s hard to find what you are searching for, especially in Data sheets for MCUs or other more complex parts. Coppers let’s you create bookmarks that are saved in your local library and even are stored in the .cop file. If you share your Copper file to the community, all bookmarks you set will be provided, too. Great for tutorials or learning resources. Copper only needs a part number. This is either provided as an attribute named MPN that you set in EAGLE for either the part or package. Or you search the part using Coppers awesome part sourcing capabilities. If Copper does not have the Datasheet in its local library it will automatically query Octopart ™ for the Datasheet and will download and display it immediately. Copper will become an indispensable tool in your workflow. 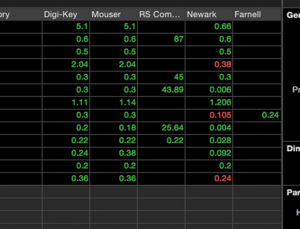 There are so many great features in Copper that help you visualize, analyze and finalize your boards. we have picked a few features that we think you will love. The best way to see all features is by reading the documentation. Copper and Copper Touch share the same engine called CopperKit. Both share the same file format and are interchangeable. While Copper for iOS is very powerful, some features are only available on macOS. Part sourcing and data sheets library is currently not available on iOS. But you get the same 3D visualization as both share the same 3D render engine, too. Apple, the Apple logo, Macbook Pro, and iMac are trademarks of Apple Inc., registered in the U.S. and other countries. 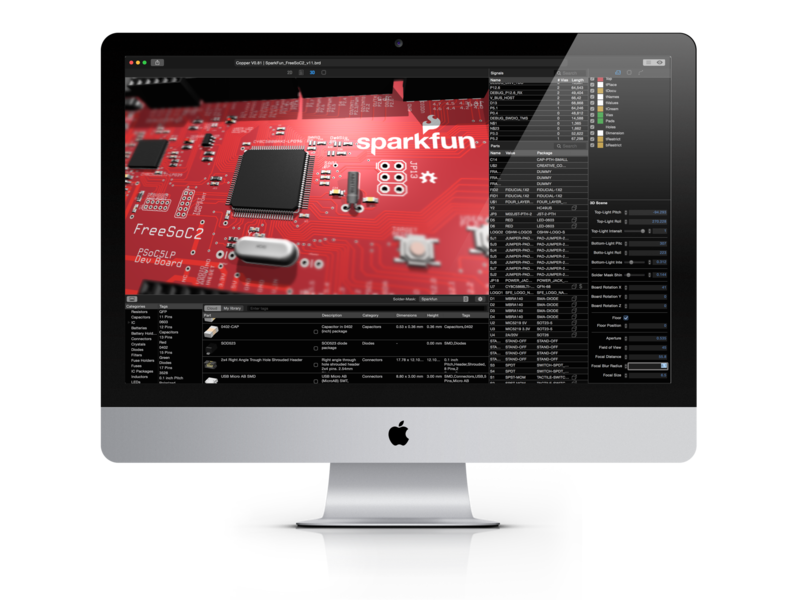 Mac App Store is a service mark of Apple Inc. Sparkfun is a registered trademark of SparkFun Electronics, Inc. Adafruit is a registered trademark of Adafruit Industries, LLC. Octopart is a registered trademark of Octopart Inc.